“Give more, get more” is a phrase that we have probably heard hundreds of times over the past six months. It is one of the main themes of this MKMMA course. Today was one of those days I didn’t have much to give. I was tired after a long day of travel, the laundry and dishes were piled up, and it looked like a tornado of toys had blown through my house. My little boy also had gotten crazy with the markers and had carried his artistic talent all over the hard wood floors as well as his face, arms, and legs. For any of you stay at home mom’s out there, you know “those days” where nap time can’t come soon enough. It never did come today, but thanks to my awesome neighbors, I got a one hour break while my little guy got to play with their cat and bunny next door while I got my follow-up done. In my last post I talked about GMO’s and how strongly I feel that it is unethical to package foods to appear healthy, while they contain many potentially harmful ingredients and toxins. One thing I have noticed over the past few weeks, is that I am finding myself in these conversations with people just sharing the truth and giving the awareness to others that I have recently acquired myself. Most of the time, people are so appreciative that someone would take the time to share the truth with them. We will soon be developing a list to expose the opportunity of the Master Key Experience to our contacts. I am really looking forward to sharing something that has been so valuable to my personal growth and development, but also to create a platform where I can share the truth and information that I come across that can educate people and bring awareness to these important topics that can affect our well-being. I haven’t been able to give all that much so far, but the intention is still there. Awareness is such a powerful thing. Ovet the past several weeks I have learned more about the food industry than I ever wanted to know. Ignorance can be bliss, but in this case, I am so grateful to have learned what I now know. Coming from 10 years in the weight loss and wellness industry, I was absolutely stunned at some of the things I have recently been made aware of. I was just recently certified in a new weight loss bootcamp program, so naturally I was really excited about it and it came up in a casual conversation with the dad of a little boy that befriended my little boy at a play center near my home. I was just explaining how sophisticated and eye-opening the information was I was learning. Then he asked me a brilliant question,” What do you think the one thing is that people are doing with thier diet that, where they think they are doing something right, but it’s hurting them.” I really had to stop and think about that for a few minutes, but then the answer was crystal clear. GMOs (Genetically Modified Organisims). I never realized that approximately 75% of the produce found in main stream grocery stores is sourced from commercial farms that grow GMO crops. I just think the idea that someone is trying to be budget conscious and purchase fresh produce in an attempt to feed their family a healthy diet, when they are likely getting a product that “looks” healthy, but is contaminated with toxic pesticide residues, devoid of much of the nutrient content it should have, and highly likely to contribute to genetic mutations at the cellular level is horrific. I personally believe this level of deception is on par with the fall of man in the garden of eden. The fact that the USDA, FDA know full well the danger of these foods and protect the producers, because it puts more money in their pocket, while private organic farmers have to jump through hoops to provide wholesome, nutrient rich produce just makes me ill. All I can say is that I am proud to be a part of this growing MKMMA organization, and that a portion of the money I have donated to further this program is going toward fighting this totally corrupt practice. There is so much more I could say on this topic, but I will save it for another post. Well, here I am, back to my blog site after a very long four weeks of difficult circumstances that have risen up in an attempt to derail me from staying the course. The emotional and physical challenges have been quite intense, but I feel good sitting here writing, like I am climbing out of a deep pit that I fell into. When I look back on this past month, I am so thankful, first of all, that I know I am on the other side of it and I didn’t give up. I have a tendency to be harder on myself than anyone else is. I am sure many of you can relate. I met with my doctor last week and he reassured me that I had every right to be feeling the way I was. Let me paint the picture for you. Couple the stress of a major move from a buzzing city in Colorado where it is sunny 95% of the time to a small country town in Minnesota where it is gray and frigid cold 95% of the time with starting a new business when you are pregnant and the full-time mom of a busy, too smart for his own good toddler, no satisfactory childcare openings, and no gyms within a 20 minute radius that offer childcare for moms. Let me tell you what you get: anger, sadness, anxiety, stress, severe low back pain, guilt, sleeplessness, nausea, despair, frustration to name a few. I was laying in bed awake one night last week and I came across a video clip by Lisa Bevere: Girls With Swords I choose to believe that I am on the right path and that there is major victory ahead. I believe that the enemy is intimidated about who I am becoming and who I might be. I am so thankful for the faith I have been able to hold onto through this, the support of my husband and family, and the true friends that have come along side me to lift me up through some tough times. If you are reading this and going experiencing some of the difficult emotions I have described, be of good cheer. You are on the right track. Keep putting one foot in front of the other. Declare that you are a hero and claim your victory. What moves you to take action? These are the things I love to learn about my clients. I have worked for many years in the arena of health and wellness, specifically in weight loss. I have had the privilege of working with hundreds of people, seeing their lives transform right before my eyes. Being overweight brings so many residual emotional side effects as well as the more evident physical ones. If I could pinpoint a common theme to what I have taken away from the MKMMA experience so far, it would be that everything starts in the mind. Once a person makes the decision they are ready for positive change in their life, I get to go to work helping them uncover what has been blocking them from attaining their ultimate goal. Those of us experiencing the MKMMA course know, of course, that we are truly our only obstacle, and it is our thinking that keeps us stuck or propels us forward. What is fascinating is that some people are motivated by pleasure, but most people are motivated by pain. When it comes to the issue of weight loss, most of the time there is a defining moment for a person that things get to a certain point where that spark goes off in their mind that enough is enough and they take the first step toward getting help or making choices that will get them out of the position they have found themselves in. Sometimes it is a hurtful comment, sometimes it is an embarrassing situation like not being able to fit into an airplane seat or a ride at the fair with their kids. I have wondered why it has to come to this. Why is it that people are not motivated by the idea of living life to the fullest, having abundant energy, peaceful sleep, and a body free of pain? Sometimes is my travels, I encounter people, and they begin talking about something they would like to be different in their lives. Sometimes I think there might be a sign on my forehead that reads, “Please tell me everything.” I love it, though. I love finding out what people’s goals and dreams are and what is getting in the way of them accomplishing those goals and dreams. One of my favorite questions is, “So, what is stopping you from making that happen?” Of course, there can be a whole host of answers depending on the situation, but ultimately, they are usually excuses that outweigh their desire for change. I was talking to a lady while I was waiting to board my flight and she told me how she was going to visit her son and grandkids in Phoenix. Keep in mind this is January and she and I both happen to live in MN where it was below zero most of last week. She went on to tell me how she and her husband are both retired and it should be them living somewhere warm. Naturally I asked her what was keeping her from moving. She said they have a large house and it will be quite a process. I got the impression that she has a lot of stuff and would need to downsize. OK? What about selling the house furnished, or having a moving sale? She said, yes, maybe, but I would still have to go through what pictures we would take with us. Oh my word. I had a hard time understanding how “stuff” could be keeping this woman from being there to watch her grandkids grow up. I pray that she will find her inspiration while she visits them over the next two weeks to start the process of leaving stuff behind to go make memories that will last forever. I am so thankful to be a part of this course and to have rediscovered my true purpose of coaching people into their fullness of life and helping to ignite their inspiration. It is truly a blessing. Often times the first point of contact I have with someone is when they decide to lose weight, but in the process I get to be there as they transform and shed those pounds that were holding them hostage in their own body. In a way it is a similar process to what I have experienced in the MKMMA course. Even though for me, extra pounds wasn’t what was holding me back, I have gone through a mental diet and detoxification process that has freed me to uncover my true purpose and be able to walk in my gifts to help make the world a better place. I could let shame win and keep it a secret that I need a breakthrough, but that would be exactly what the enemy of our mind wants. Instead, I choose to operate in courage and bring it to the light to squelch the power of darkness. I have experienced some intense pain this week, and I have also experienced intense joy. I find that each time I press through the pain and choose to keep moving forward, there is a breakthrough right around the corner. I am also grateful for some strategies that I learned this week to take control and be the observer of those painful emotions rather than let them affect me like they once did. I even came to a point where I felt I needed to find somewhere else to stay to escape from the pain. I believe these intense painful emotions are spirits or pain bodies that are here to steal my joy, and create strife, discord, and chaos in my family. I am done with them. The enemy has been warned. If he is going to inflict pain on me and my family, I will take a break, but it will be to go out, change somebody’s life, and make the world a better place. Everything begins with thought. Everything. Thoughts can bring bliss or they can bring agony. I have experienced both particularly this week. I will tell you it might not be the best idea to embark on a new venture while 6 months pregnant. Talk about hormone overload! One day I can feel like I am invincible and the next defeated. Heck, it might even be one minute to the next sometimes. Then, I have to re-center and come back to my Why, back to my PPNs (Personal Pivotal Needs). Why did I decide to take on this new venture? Because I my needs are liberty and true health. Because, my husband spends most days working from 9am until it’s time to eat, then usually goes back to work until 9 or 10pm. We have been fortunate to earn a lot of income, but after overhead and taxes, there isn’t even enough left over to save anything for our future. I know we are not the only ones in this position. I believe there are millions of people out there struggling to make ends meet, wondering if there is a better way. Meanwhile there are millions suffering all over the world without food or clean water, because the people that are called to rescue them are stuck in unfulfilling jobs to barely keep afloat. Being short on funds isn’t the worst thing, especially if you have your loved ones. I imagine mom’s that have to wake their kids up before they’re done sleeping to rush off to daycare and leave them all day. Some days they cry and say, “Mommy, I want to come with you! Don’t go!” But she has to. She holds it together just long enough to get into her car, and the tears start to fall. She wants to be with her babies, but she has to sit in traffic, spend the entire day with people she doesn’t care to much for, only to make it home in time to throw something together for dinner, hurry to get the kitchen cleaned up and kids bathed, maybe some play time that ends too quickly, a couple of stories before bed, and then it starts all over again the next day. I do it for her. I do it for the people who know in their spirit there is something better out there for them. They are praying and waiting for an answer. If I don’t pick up the phone, or reach out to someone that crosses my path, they may have to keep waiting and praying for months or years. I am there to offer them a gift. Whether they choose to receive it is entirely up to them. I do it to prove to it is possible to escape one’s current situation, even if circumstances make it difficult to see how it will be accomplished. I do it to help unleash human potential for good. I do it because I get to sleep until my little boy decides it’s time to get up, and I usually get to rock him to sleep every day for his nap, and I am there when he get up and comes out with his blanket with an enthusiastic yet sleepy, “Hi Mommy!” before climbing on my lap for some snuggles. I wouldn’t miss those moments for the world. I want that for every mom, if she wants it, and my heart aches for those that have to miss those moments because they are at their office J.O.B (Just Over Broke). Let me tell you, if it can be done in your third trimester of pregnancy with a strong-willed, very busy 2-year-old at home with you, just about anyone can make it happen for them to. As long as they truly want what they say they want. Thinking about a goal and not having a plan of action can be excruciating. Executing a simple daily plan of action can and will lead to an extraordinary life. So what does it take? It depends on what a person wants. What kind of money would really make a difference in your life? I think we can all agree, most would answer even an extra $500 a month would make a difference. I love to show people that can be a reality for them in a matter of just a couple of short months. For me, it is an extra $1,000 per week to take some of the pressure off my husband, pay off debt, and start putting away for our future. And the really great news is that the same skills and tasks that it takes for me to reach that goal, will also take me to an extra $2,000 per week and more. That kind of money could bring at least one parent home if not both. The only thing that will stand in my way is my own thinking; thinking about what needs to be done, but not taking ACTION. Allowing fear of what someone might think to prevent me from reaching out. On the flip side, having a plan of action in place and executing it without fail is incredibly empowering and satisfying. How do you eat an elephant? One bite at a time. How do you change your life? One consistently executed step at a time. 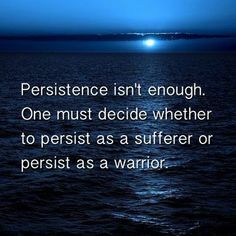 I will persist. I will succeed. I will win.